Log kya kahenge, what would people say. I’m sure you’ve heard this popular phrase numerous times before. And, you’ll definitely hear it again and soon. The thing is here in India, before we commit to anything, amongst other pros and cons we also consider what others would think of it. And, this kind of thinking has only led to an obstacle in the progress that our society could have made in time. A girl wants to wear a short skirt – Log kya kahenge? Short skirts represents a lose character. A girl wants to take up a job in a night shift call center – Log kya kahenge? What kind of girl works night shifts? Again, the characterless kinds. A girl wants to take a lunch with a colleague, who is a male – Log kya kahenge? Why would she go out with a guy, Jarur koi chakkar hoga. A girl wants to go on a trip with friends, male and female both – Log kya kahenge? Akeli ghar se duur jayegi, zyada hi parr nikal aye hai. 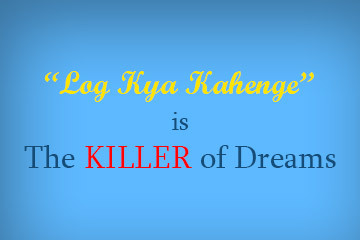 A girl is married to the worst kind of monster, and she wants to have a divorce – Log kya kahenge? Jarur ladki mai hi koi kami hogi, ki sath nahi nibha payi. A raped girl wants to go and complaint to police and seek justice. – Log kya kahenge. Humare khandan ki badnami hogi, teri shadi bhi nahi ho payegi. Teri behen ki shadi kaise hogi. These are some other conditions where their own parents/guardians make dust of a girl’s desires or actions. And, not only for girls but there are thousands of similar conditions for boys too. A boy wants to do a summer job during his vacations. – Log kya kahenge? Itne bure din aa gaye ki ladke ko aisi chhoti moti jobs karni pad rahi hai. Next articleHow Can I Improve My Writing Skills?